When comic book illustrator Steve Lieber heard that his recently released graphic novel, Underground, was being pirated on an online forum, he decided to take action. No, he did not threaten the perpetrators with lawsuits. He got on the forum and talked with them. The forum discussion caused a spike in Underground’s sales, and Lieber now plans to incorporate free digital downloads into the marketing of his future work. Some issues of his past comics are now available as free downloads on his website. Fifteen years ago, Lieber’s experience was unfathomable. Now it embodies the modern digitized environment – an environment that might pose a threat to independent comic book stores and traditional consumption. Batman and Superman, who first appeared in comics prior to World War II, are now available digitally as many comic book producers offer their content as PDFs, tablet and smart phone apps. Going Digital: Dream or Nightmare? Zach Power, the owner of Iowa City’s Daydreams Comics, does not feel any immediate threat from digitalization. However, Power, who has owned the 25-year-old comic shop for the past seven years, said digital comics eventually could become a concern. “I wouldn’t be surprised if at some point monthly [comic] books are just released digitally. I’m sure they’ll never get away from printed graphic novel collections, but the monthlies could go the way of the dinosaur,” Power said. 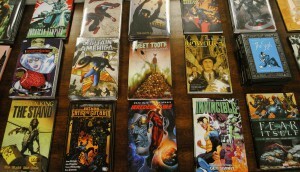 Kyle Gonyea, who opened Multiverse Comics & Games in Grinnell last spring, was also unconcerned about the digitalization of comic books hurting sales. Partially because comic books account for only a fraction of his sales, but also because he believes a niche fan base will always want the physical format. Some collectors will drop serious cash to add to their collection. In 2010 a copy of the first comic in which Superman appears sold at auction for $1.5 million. Even for non-collecting purposes, some fans prefer the physical format. 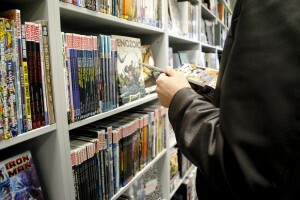 While browsing at Daydreams Comics, University of Iowa student David Pierce described how having an actual comic book in his hands was part of the reading experience. Other readers, however, see digital as an additional experience, not a replacement. Joe Irwin, a regular Daydreams’ customer, said some digital devices, such as the iPad, offer different but enticing reading opportunities. Some readers and producer, including Power, argue that the change from ink to pixel brings lower quality images. But comic book illustrator Brent Schoonover, based out of St. Paul, Minn., sees little difference between print and digital images. 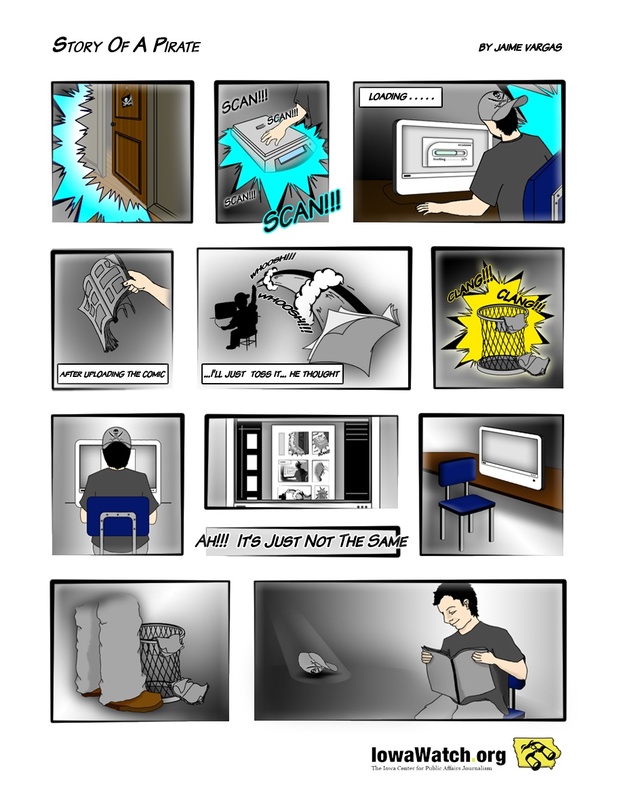 Instead, it is the format and presentation of digital comics that Schoonover critiques. Schoonover feels that part of the art of comic books is “the complete package” – how the illustrator draws the images, laying them out on the page in a way that leads the reader from one panel to the next. However, many of the apps for viewing digital comics show the reader one panel at a time. Ryan Dunlavey, a comic book illustrator and publisher from New York, said the additional benefits of digital comics will win-out over any perceived diminishes in the comics’ visuals. As a co-owner of Evil Twin Comics, Dunlavey creates and distributes many comics through PDFs and smart phone apps. For Dunlavey, the digital format offers a cheap way to increase exposure and business. His comic book series Action Philosophers gained popularity after he made one of the issues available as a free download. Currently, Dunlavey makes more money from his print releases, but he thinks that digital sales could eventually surpass print. Supporting Dunlavey’s assertion, ICv2, the most popular distributor of digital comics, says sales have tripled over the past year. But some fear increased digitalization of comic books will prompt more comic book piracy – similar to what happened in the music industry just over a decade ago. The threat is great enough that Marvel Comics and Time Warner – DC Comics’ parent company – support the Stop Online Piracy Act, a bill that would increase the punishments against websites engaged in piracy. Although Lieber’s experience with pirating appears to be an increasing trend, Power, Gonyea and Dunlavey were dismissive about the threat of pirating. Power and Gonyea cited fans’ book collections and attraction to the physical page, while Dunlavey said that if he executed his job properly fans would want to buy from him rather than steal. Schoonover sees piracy as a serious threat, but said the comic book industry should preemptively address the problem and learn from the music industry’s mistakes. The comic book industry needs to establish their equivalent of iTunes now instead of as a belated response to rampant stealing, he said. Dunlavey’s ultimate assessment of the growing digital world provides an optimistic twist to the increasing online thievery and reflects Lieber’s encounters with his pirating fans. “Anything that increases the availability of comics, or any other art, is a good thing,” Dunlavey said. Iowa Veterans Answer The Question: What Does It Mean To Support Veterans? The question: How can Iowans turn the phrase “support our veterans” into action? The answers: In this IowaWatch Connection podcast. Why is there Hatred in Hip-Hop?